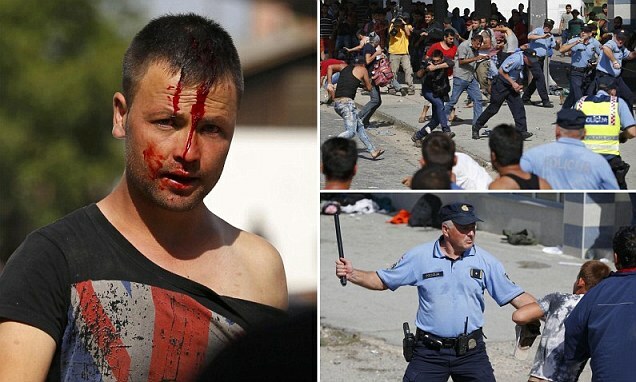 AFGHANIS AND SYRIAN BRAWLING AS THEY TRY TO BOARD TRAINS ACROSS CROATIA…… – The Tundra Tabloids……. They’re brawling here in Finland and elsewhere as well. Rocks, smashed glass bottles and sticks were used as violence broke out (top right) between Syrian and Afghan migrants at the Beli Manastir train station in the northeastern Croatia this afternoon. A number of migrants were injured during the clashes (left) while police officers used batons as they tried to break up the fight (bottom right), which started at the ticket office. The chaotic scenes unfolded as Hungary continued to build a giant fence along the Croatian border – just days after sealing off access from Serbia with a 100 mile razor-wire barrier. Hundreds of Hungarian troops are being called in to help build the barrier just days after the country erected a 100 mile razor-wire fence along its border with Serbia. Previous Post Previous Post ISLAM 101 IN MARTTI AHTISAARI’S SAFE HAVEN OF ACEH INDONESIA…….